Should you go to Sleep School? Before going to sleep school, I had no idea that there was actually (in some people’s minds) a stigma associated with sleep schools. Here I was freely telling anyone who would listen about how excited I was to be taking myself and Frankie off to the Masada Mother Baby Unit’s five day residential program, when some people were probably judging the hell out of me. At first, I was surprised to learn about the stigma, but then upon reflection, I can understand where it comes from. As mums, we can be so reluctant to ask for help, because if we ask for help, that obviously means we are not coping and we are therefore a crap mother, right? Not only is there stigma, but there also seems to be a lot of mystery (“What happens behind the closed doors of sleep school?”) and this was definitely one of my motivations for starting this blog. For example, people talk a lot about the Masada “patting”, but often in vague terms that are not actually that helpful. I know before enrolling in Masada, I was reading people’s blog posts about their experiences and there wasn’t a great deal of concrete information, even though they all sung Masada’s praises. And finally, I think there are a lot of mums with babies who are not terrible, waking-up-every-hour sleepers, and think: Isn’t sleep school only for those in dire straits? I probably fell into this category. Aside from the fact I didn’t have a woeful little sleeper, for the first 10 weeks of her life, Frankie would only sleep for chunks of two to three hours at night. Our maternal health nurse had suggested these periods of sleep time would extend by the time Frankie hit about six weeks, but this never happened. Also in the back of my mind was the fact I was returning to work part-time in June, and I kind of wanted to be getting more than three lots of two hour chunks of sleep overnight. You know, just so my brain could actually function and I could improve my post-pregnancy, sleep deprived goldfish-like memory. If you are sick of hearing the advice “sleep when your baby sleeps” (particularly useful advice if your little one doesn’t sleep) and if even trying to stick to this piece of advice is leaving your exhausted: enrol. 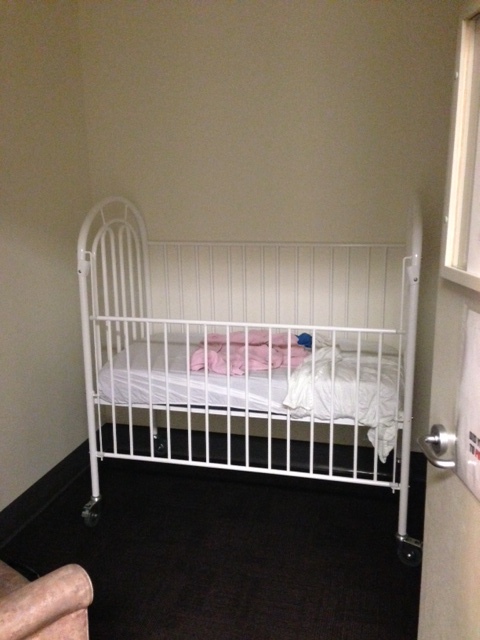 If you are not sure whether your bub is a “bad enough” sleeper: enrol. Just the fact you are questioning it means that things could be better. If you are going back to work and your bub isn’t giving you enough sleep to be able to function like a normal human being: enrol. If you are worried about the sleep school stigma and are nervous about asking for help in fear that you will be nominated for “worst mother of the year”: enrol. And dump those friends that would judge you for such a decision. Like us mothers need more judgment. And if you are hesitant to enrol because you just have no idea what goes on in a sleep school, you might like to have a read of this blog as I have tried to give an accurate picture of what to expect (at least, what to expect at Masada). And hey, even if you enrol, you can always pull out if Murphy’s Law strikes and your little one becomes a superstar sleeper. Incidentally, a couple of days after I enrolled Frankie, she slept for a full seven hours – but sadly this was never to be repeated, so we kept out place at Masada. So after five amazing days at Masada Sleep School, it’s home time tomorrow. From chatting with the other mums, everyone seems excited to be going home. I know I feel like I have a big suitcase full of tools that I can use with Frankie to help her sleep better and be a more predictable little baby. Frankie had another great night last night. Like a little sleep machine, she self-settled within about five minutes (on her own) after I put her down grizzling loudly at 7pm. I did a dream feed at 11am, and then one of the wonderful night nurses fed Frankie a bottle of EBM at around 3am (and also changed Frankie’s outfit as she had a nappy leak – damn you nappy!). I could see in Frankie’s notes that she was put back down to sleep after all that, wide awake, and apparently was quiet and went straight back to sleep. I then woke Frankie up at 7am to start the day (yes, it is OK to wake your baby), even though she definitely could have kept sleeping soundly. Frankie wormed her way half up the cot last night. On the topic of leaky nappies, I got some great advice on that this morning: try putting a cloth nappy over the disposable nappy OR put a second nappy on top of the first nappy. Gold. I have also now had a few goes of doing the Pat Pat on Frankie. The first couple of times I did it, the biggest problem I ran into is Frankie being a squirmy worm and wanting to roll back onto her back. 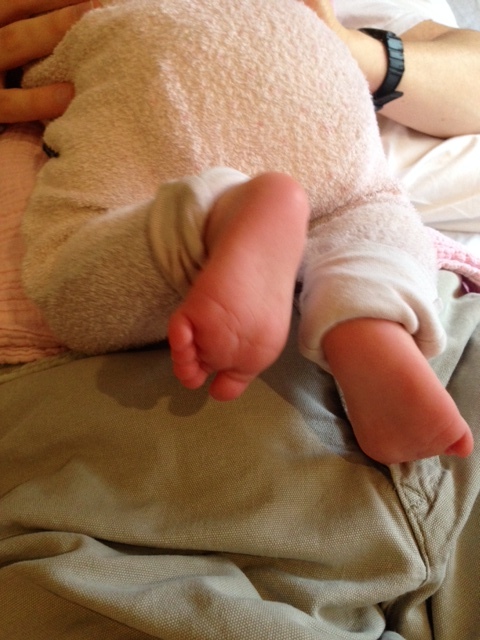 Frustrating – because both hands are patting and unfortunately I don’t have a third hard to hold her down. I asked what to do and I was given some great advice: first, when positioning the baby on their side, make sure you roll their legs over so they are facing the side (not just their torso/shoulders) and second, use the sheet to cover their shoulders and pull it tight so it keeps them in position while you pat. Using these techniques helped a lot. Also, as a plan B, you can leave the hand on bub’s shoulder secure and just move your fingers to pat on the shoulder (and do the proper pat on the hips). I hope that all makes sense! I’ll try to create a video of what I am talking about over the next few days in case it all sounds like gibberish. To change the nappy overnight or not? This was a question I had always wondered about. At home, my husband and I would oscillate between obsessively changing Frankie’s nappies through to letting her sit in her wee and pooh overnight to avoid waking her. The answer is: change the nappy if is completely soiled (i.e. it feels really heavy) or if there has been a leak and the bub’s clothes/blanket are wet. Because no one likes to sleep covered in urine. – To blacken out a room (because despite Black Out blinds being called Black Out blinds, they don’t really black out the room at all, do they? ), use black garbage bags blu tacked to the window or black art paper. The trick is to have the room completely black until your baby has learnt how to self-settle and sleep well (the length of which differs for every baby). – Try to book appointments (e.g. doctors appointments) for the afternoon because the morning sleeps are more important, of better quality, and longer. This is also good advice for mother’s groups trying to decide when to meet for coffee – afternoon is better than morning from a bub’s sleep point of view. – When out and about, bring your bub’s cot toy or comforter that is a sleep cue, and hide it until it is time for them to sleep, and then place it in the pram when it is nap time. – When I was out walking with Frankie a couple of days ago, she kept falling asleep in the pram even though it was “wake time”. I poked and prodded her (probably looking like a very strange and annoying mother to passers by) to keep her awake. But I was reassured during yesterday’s session and said if they do happen to fall asleep when you are out with them during “wake time” just treat it as a cat nap and get back on schedule when you get home. 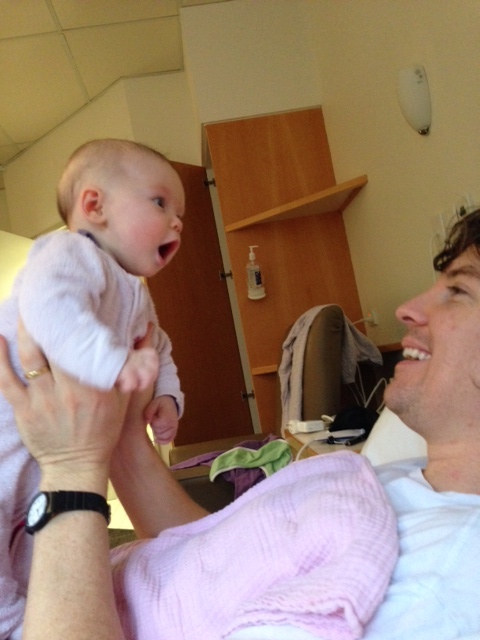 – When your baby wakes after every sleep or nap, take them to the window and tell them what time of the day it is (e.g. “It’s morning Frankie, time for breakfast”). Doing these little things will start to get them used to it being day time, and different from night time. Check out is at 8am, and they have recommended that the baby’s room at home be all ready to go so they can be put down for their first nap as soon as we get home. My husband just called me before to tell me he put up about 30 garbage bags on the windows of Frankie’s room and it is now pitch black. Brilliant. I’ll keep posting updates on life after Masada. If you are keen to be notified of when a new post is uploaded, just go to the top of the right side tool bar and click on Follow. I love hearing all your comments and questions. And if you do have any questions before I check out of Masada, please post them below and I’ll try to either answer them myself or ask one of the Masada Nursing gurus. 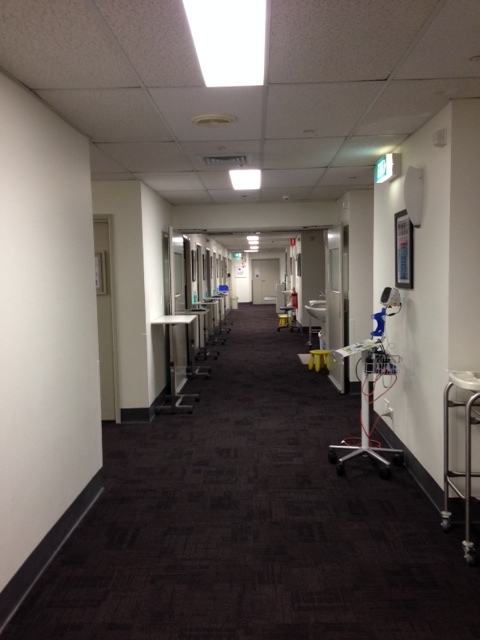 Time to say bye-bye to this corridor that has become my home over the last five days. Before I get started, you can now “follow” this blog and get alerted when new posts are uploaded – just go to the right-hand sidebar and click on the “Follow” button. Simple. I spoke to my parents at about lunchtime yesterday and was telling them (well, boasting) about how Frankie was going. If you read yesterday’s post, you might remember that Day 3 is the day where the mums start to do the settling themselves. We watch a nurse do it a couple of times first, then a nurse observes us do it a couple of times, and then we are on our own. So I said to my parents, “Frankie hasn’t grizzled at all today! I might not get any practice resettling her!” And of course, upon getting back to the hospital room, Frankie starts grizzling like a grumpy old cat. So after watching the nurse settle Frankie a couple of times (successfully), Frankie again turned grizzly towards the end of her afternoon nap. I had my first shot at settling Frankie with the Pat Pat technique and it worked a dream! She grizzled a bit on my exit, but then calmed right down and did another sleep cycle. Amazing. Pre-Masada, I would have (guiltily) put her straight into the electric swing. Last night, all of the fathers came in for a session on settling as it is super important that the baby have consistency with settling techniques. My husband was telling me they were all taught the Pat Pat, and then practised on each other. I guess that fully grown men are similar to babies? The fathers are then allowed to stay overnight, which was nice for my husband to get some time with Frankie before bed and in the morning. It’s awesome that Masada incorporates the world outside of mother-baby to help enforce the techniques we learn here. This afternoon we have our final group session about life post-Masada. We have also been told that it is Q&A time for us too. So I figure that session will go for about 36 hours. I continue to bombard all the nurses with questions, so here are a few more things I am learning. And no doubt, tomorrow’s post will be a big one with everything that comes out of this afternoon’s session! – A few people have asked on the blog about what to do if the Pat Pat doesnt work. If you find yourself in this situation, and if you have done the Pat Pat three times, then give them a “cot cuddle” (sit them up in the cot and cuddle them until they calm down), and if that doesn’t work take them out of the cot and give them a cuddle until they calm down – then do the Pat Pat routine. – Someone asked about whether you make any noise when Pat Patting. The rule is – if the baby makes noise, you Shhhh, and if the baby is quiet, you are quiet. Easy. Although not easy to count to 100 when you are also trying to Shhhhh. – One of the nurses gave us a great piece of advice yesterday. She said “Focus on the (Pat Pat) process, not on the sleep”. If you are in with the baby and all you are thinking is “please get back to sleep”, it is only going to stir you up more – and if you are stirred up, the baby can sense this and it rubs off on them. – When it comes time to drop the red eye feed (as I call it – that is, the one between 3-5am), the trick is to just resettle them at this time, rather than feed them. It might (apparently) take a few resettles at first, but I have been told to persevere for a few nights and she should start sleeping through. We get to drop the red eye feed when the baby has doubled its birth weight. I think I might feed Frankie some sneaky doughnuts to help speed up this process. – I always wondered how much time needs to pass when you are timing the grizzle/cry before you reset the clock. The answer is five minutes. For example, if you haven’t heard a grizzle for five minutes, then you re-start the timer for another 10 minutes before going in to resettle (if you need to). – If your bub wakes at 6am, but you are working on the Masada wake time of between 7-8am, I was told to resettle, and if the baby hasn’t resettled by 6.30am, get them up and start the day. 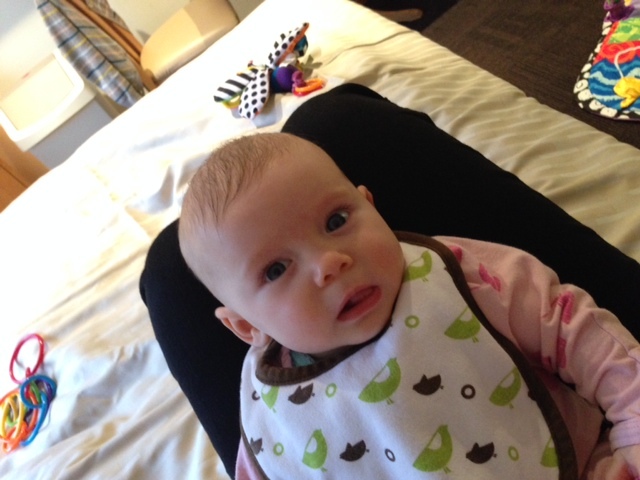 – Here is a funny one: Frankie always yawns for the first 5-10 minutes of the first feed of the day, without fail. I think to myself, “Frankie you have been in bed for 12 hours – how can you be tired already? !” But apparently, tired signs in the first 5-10 mins of awake time actually means they have had a great sleep! Good to know. – Masada use Ergo sleeping bags. In case you are interested. – The maximum nap time Masada recommend is three hours. Any longer than this can throw the day out of whack. As I finish this post, I am excited to say that I put Frankie down 20 minutes ago for her second nap of the day and although she grizzled for a couple of minutes when I left the room, she has been quiet ever since. Go Frankie! Our final group session with Q&A time starts in 90 minutes. Keep the comments and questions coming and I’ll try to answer them all (or seek out answers for you)! A gratuitous bum shot. Just because it is so cute. Miracle of miracles – I am writing this blog post having just put Frankie down for her second nap of the day (at 11.40am) and after grizzling her head off for a few minutes, she had self settled by 11.45am. Has someone swapped Frankie for another baby? We had a great session with all the mums with babies under 6 months this morning with one of the nurses, who was a whirlwind of brilliant information. She said at the start – “don’t worry, you won’t need to take many notes” – but of course, I found myself writing non-stop. Note to self: bring iPad to next session. Feed 3-5 hourly during the day, and within 15 minutes of getting the baby out of the cot. Allow a 45 minutes window for feeding – after this time, the Milk Bar is officially closed. The reason for this is to teach the baby that milk does not flow on tap around here. Prior to sleep school, Frankie was a major snacker. In my pre-admission interview with Masada, the nurse said to try to stretch Frankie out to 3 hourly feeds (just extending each window by 5 minutes until we could reach 3 hours). The snacking cycle is hard to break – but important to break as it helps babies feed better. As tempting as it is to multitask while I am feeding (I feel so “inefficient” if I don’t have my mobile phone or ipad in hand or on lap when I am feeding), one of the nurses suggested just focus on the feeding when they are feeding – especially during our time here at Masada where we don’t have the duties and distractions of the outside world. This will allow me to actually focus on whether Frankie is feeding properly. She shared a story about a mum who was constantly on the laptop while feeding, and she never noticed that her baby never wanted to feed from one side – which was the side by the laptop. There were a few comments on Facebook about babies becoming dependent on pitch black rooms. This was brought up this morning and it was recommended that after Masada, we try to stick to the “Masada rules” for 2 weeks (as strictly as we can), and as the bub learns to become a better sleeper, you can slowly let more light into the room, and they will also naturally become better at sleeping in the pram, car, grandma’s, etc too. Frankie’s “bedroom” at Masada, which becomes pitch black when the door is closed. Apparently hiccups are a tired sign. Who knew? For morning naps, try to do three sleep cycles (one sleep cycle is around 45 minutes). This is the most important nap of the day – seems to get them off to a good start for the rest of the day. Remove all mobiles from above the bed. It is critical that there are no distractions for the baby. This is especially important between sleep cycles to help them move effortlessly from one sleep cycle to the next. When putting the baby down to sleep, give them a rub on the chest and say “time for sleep”. Another thing to help them recognise that it is NOT time to play. For the overnight sleep, always wrap the baby in the cot and if they need changing in the middle of the night – change them in the cot. This is something we had never done – but am excited to do this. If you move them out of the cot for these activities, the baby might mistakenly think that it is play time. 1. Place the baby on its side, facing away from you. 2. Say “shhhh” in a calming way (ideally until she stops crying). 3. Cup your hands like you are holding an egg and with one hand on the baby’s shoulder and the other on the hip, do a fast pat. Place slightly less pressure on the shoulder pat because it doesn’t have a nappy as a cushion. Count to 100. 4. Change to a slower paced pat. Count to 100. The idea is to bore them back to sleep (and hopefully you don’t get bored to back to sleep while you are doing it). 5. If they are still crying or grizzling, do another round of the slower pats. 6. Keep your hand still on your bub’s shoulder, and then do a single pat on the hip for 50 counts. Start slowing right down for the final few pats. 7. Move the baby back onto it’s back. Finally, never go backwards in the steps. I asked “why not”? The nurse replied “because you don’t want to be in there all night”. Fair enough. – Do tummy time midway through a play. You don’t want to do it right after a feed (too much pressure on the tummy) and too close to bed time (hello grizzle city). – If you have a playmate (like Frankie does), swap the mobiles that hang above it from time-to-time to give the baby a bit of variety. This may sound really obvious to some people, but a good thing to be reminded off nonetheless. – Spend the last five minutes of every play time doing “wind down”. This involves changing the nappy, then reading a story (rhymes are good) or singing a low key song (like Twinkle Twinkle little star). By doing this before every nap time, they will start to associate this with “time to sleep”. 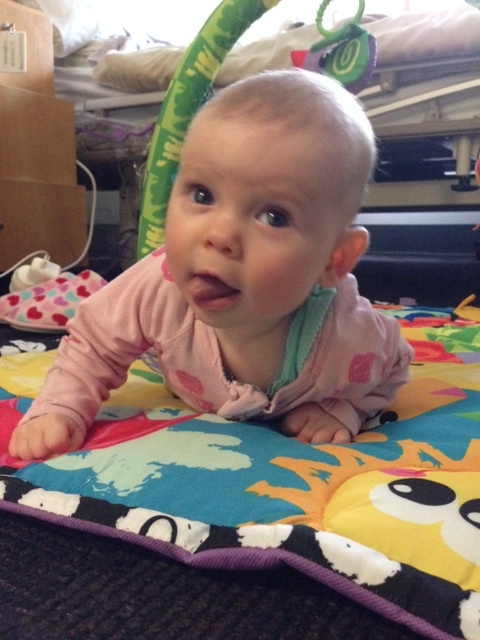 Frankie doing tummy time – and trying to lick the air while she does it. 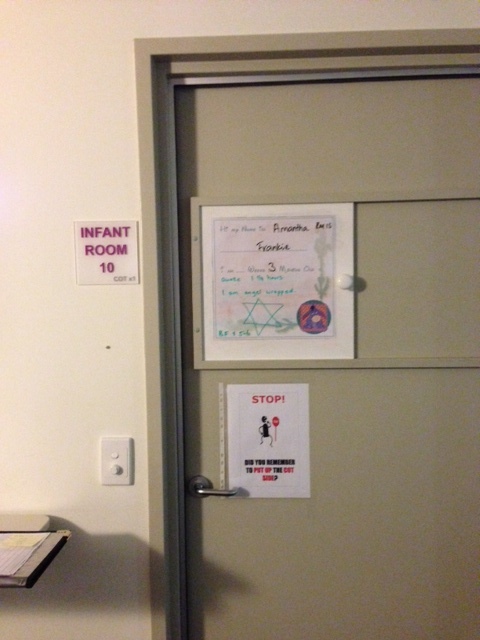 A few weeks ago, my husband and I decided to make the call to Masada Sleep School (aka The Mother Baby Unit). Except for Frankie’s first 24 hours in this world where she slept like an angel and we felt all smug – like we had a GREAT sleeper – she has been an average sleeper at best. 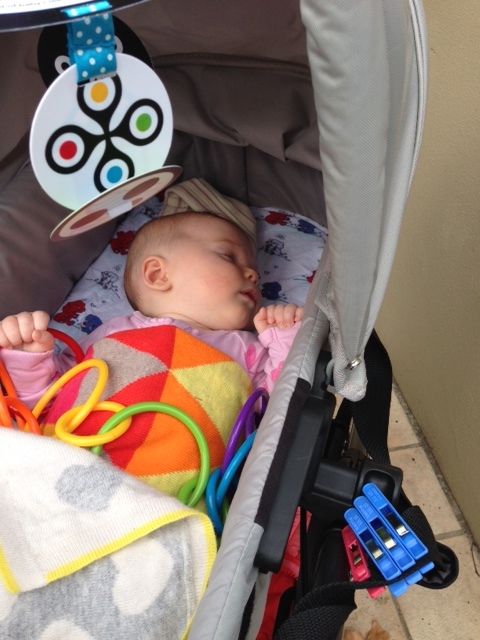 Up until a couple of weeks ago, she only managed chunks of around three hours at night, and would have a LOT of trouble self settling during the day – to the point where taking her on a walk in the pram or putting her in our amazing electric swing were the only ways to get her to sleep. 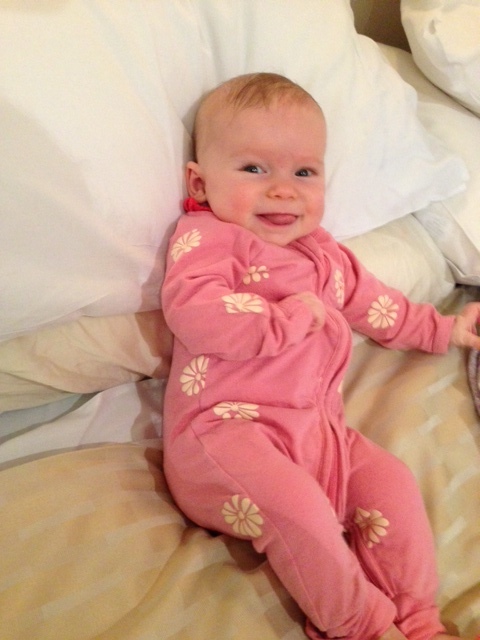 Obviously, since enrolling Frankie in sleep school, she has improved quite a bit – we even had one night where we put her down to bed at 7pm, gave her a dream feed at 11pm, and she slept until 7am – OMG! We thought someone had swapped out Frankie for another baby. 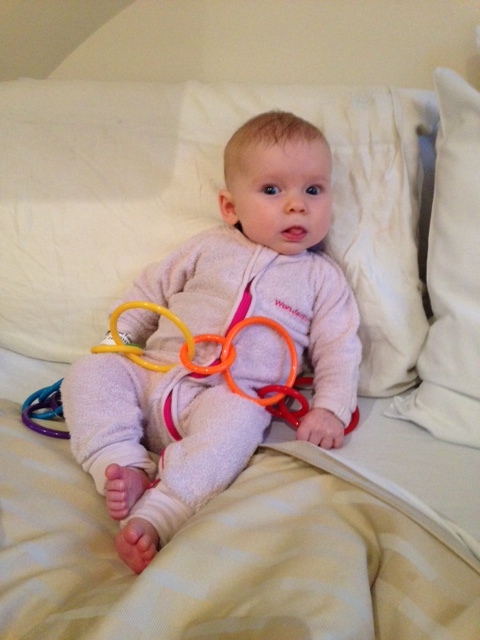 Frankie hanging out with her rings during “awake” time. 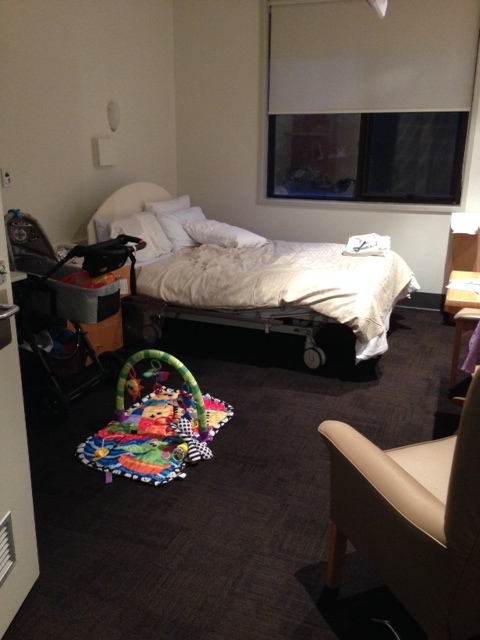 The set up at Masada is this – the ward is in a square shape, with rooms for the mums around the outside, and small rooms with a cot in them around the inside. 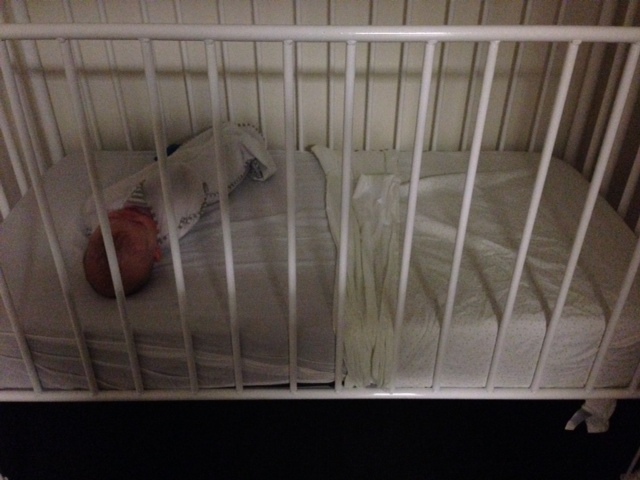 So Frankie is across the corridor from me – which in itself is a strange thing to get used to as Frankie’s bassinet at home is about 1.5 metres from my side of the bed. 2. Frankie needs to spend more time awake. At three months, Frankie should be awake for between 1 hour 15 minutes to 1.5 hours at a time (including feeding time). I know that this is probably not “new news” to a lot of mums, but we would always put her straight to sleep when she showed tired signs – such as yawning – which meant sometimes she would wake, I would feed her, she would yawn, and I would put her straight back down to bed (not that she would actually go back to sleep or anything…). So when Frankie wakes up next, I’ll feed her and we will play, play, play until the clock hits 1 hour and 15 mins. The nurses said that by the end of the week, Frankie will definitely be awake enough not to start showing tired signs almost as soon as she wakes. 3. I had heard Masada used controlled crying and that this had put some mums off. So I thought I’d report on what they have used with Frankie (which seems to be much nicer than letting the bub cry out). In a nutshell, Frankie is allowed to grizzle for 10 minutes and then a nurse goes into settle her if she hasn’t calmed down. If this escalates to a cry, then they go in after two minutes. Sometimes I have trouble working out what is a cry and what is a grizzle – am hoping to know the difference well and truly by the week’s end. So far I have learnt that a grizzle sounds like a grumpy cat, whereas a cry is louder and more constant (and heartbreaking to listen to!). My room at Masada Sleep School.